SOUTH DAKOTA -- The South Dakota Wing provided important fire-spotting capabilities in the early stages of a Black Hills forest fire that killed one person, injured two firefighters and destroyed 33 houses. After lightning sparked the Alabaugh Canyon fire July 7, South Dakota Wing members made frequent fire observation flights in the early stages of the fire under the organization's memorandum of understanding with the state until the size of the blaze prompted the U.S. Forest Service agencies to bring in its own aircraft. 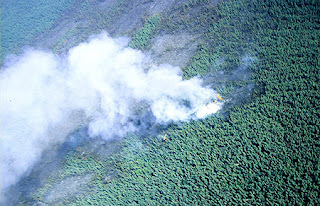 The wing essentially acted as an Air Attack platform for state fire officials to direct the aerial attack on the fire, using helicopters and single-engine air tankers, said Col. Mike Beason, wing commander. "The state appreciates the availability of CAP," Beason said. "They had us on immediate alert status since July 1st so they could get airborne rapidly when a fire would break out." The South Dakota Wing has made over two dozen flights since early May, logging many hours in the fire-detection role. "Primarily, the state has had us fly fire-spotting sorties," Beason said, "especially after lightning storms, but also during the Fourth of July fireworks season." Good Job SDWG! I have been working with the NJ State Park Service this summer between semesters, and know a person who was fighting the wildfire in Wharton State Forest. The NJSPS has it's own aircraft that fight fires, but I would imagine that many of these state agencies could use cheap spotting aircraft. Seems like a natural role for CAP. Although CAP could probably not participate in actual bombings. That takes a lot of specialized equipment and training for the pilots and aircrews. Besides, as pointed out in this thread, CA would never allow it to happen. However here in Dirty Jersey and some of these other smaller states might be able to use CAP as a fire-prevention resources.